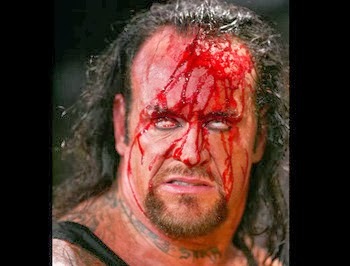 Undertaker, wrestling's finest, the definition of what it means to be a a true professional wrestling superstar. Mark Callawy is the real name of wrestling phenomenon The Undertaker. 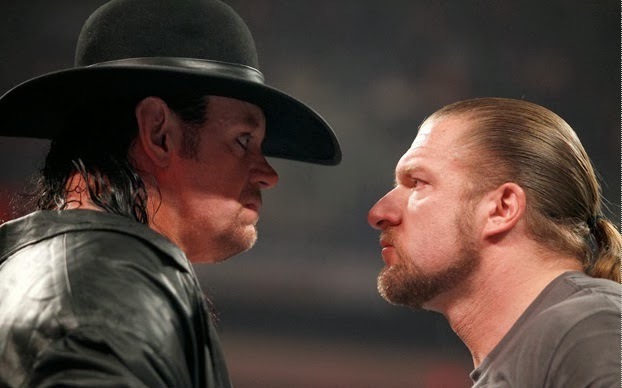 Names like deadman, the phenom, and the last outlaw, will all remain in wrestlings fans memory far after Taker is out of the ring performing choke slams, big boots, and of course the always devistatiing tombstone pile driver. 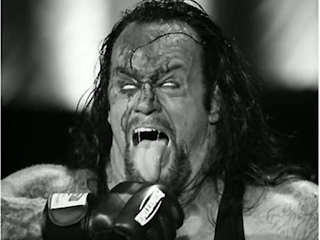 The legacy of the deadman lives on forever, but how exactly did it start? No he is not retiring yet, and this article might seem like I am previewing that however I am just honoring a wrestling gods career. But you have to take the time to understand that the man who is a perfect 21-0 at Wrestle Mania's career is slowly coming to a close. We will sort of venture into a tribute/rememberance of "The Demon of Death Valley's" already unforgettably successful career in his given character. Why? The time has come once again...the build up is looming to the legends return for Mania in 2014. Would that not get you just a little exited? Today were going to talk a little bit about his career and how exactly it started and how it took off and made him the star he is today in WWE entertainment history. If you don't know who Undertaker is while reading this at this moment, get a paper and a pencil out and write some notes...you will be learning about one of the most gifted men to EVER set foot in the unforgiving ring. Calaway's career began in 1984 as he wrestled his debut match at the age of 19 in World Class Championship Wrestling, a decently popular wrestling promotion that didn't really draw to much attention. His first match was a loss to wrestling legend Bruiser Brody under the ring name "Texas Red". His career didn't take off until one man, one wrestling phenomenon put in a good word for him in the WWF. 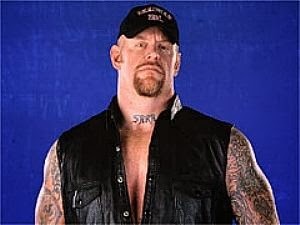 Taker was wanted by the wrestling empire...and the decision to sign with Vince McMahon's successful promotion would soon prove Calaway as one of the greatest pro wrestler of all time. Hulk Hogan had seen Calaway wrestle in WCW and pitched him an offer to come over to the competing promotion...WWF. Mark did not make the wrong decision and quickly accepted an offer from the owner of the promotion...Vincent Kennedy McMahon. Vince saw from the second he shook his hand for the first time that he had a star on his roster. WCW was later old to the WWF (now WWE) making it the largest and most watched wrestling industry on the surface of the Earth. Take a quick second to picture something in your mind. Your watching a scary of movie and the screen goes black....you hear 3 bells sound and your in a graveyard. 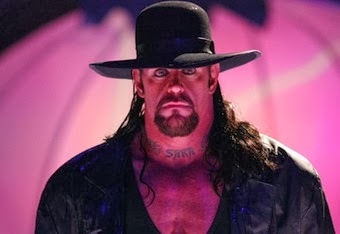 You see a man, a tall scary looking man with long black hair arise from the surrounding gravestones wearing a black trench coat and stetson hat. The sketchy guy slowly starts to dig up a grave and looks back at you and rolls his eyes behind his head, now only being able to see the white in his eyes. The man you were looking at in that spooky cemetery at night was the terrifying man who would now go by the ring name... "The Undertaker". Yes, this man is still Mark Calway. But now this 6 foot 10 monster who was struggling to find a character to strive in was finally set, ready to venture on into the land of wrestling success. Wait what? Your probably like why the hell are you talking about scary men in grave yards? Well you just learned who the Undertaker character was. A freakish and manipulative man who strives on portraying a wreslter who is obsessed with death. -One of my all time favorite promos of the Undertaker's, it scared me the first time I ever watched it! In definition an Undertaker is a "person whose business is preparing dead bodies for burial or cremation and making arrangements for funerals". This is exactly the type of spooky guy you would see dominate the wrestling ring for the next two decades. Debuting in the WWF in 1990 the Undertaker's persona never went stale as it spooked the hell out of kids everywhere and got all the older fans involved. Though Taker never was really a full heel he never was a guy that got booed by crowds as he wasn't really a face either, people just wanted to cheer this man. 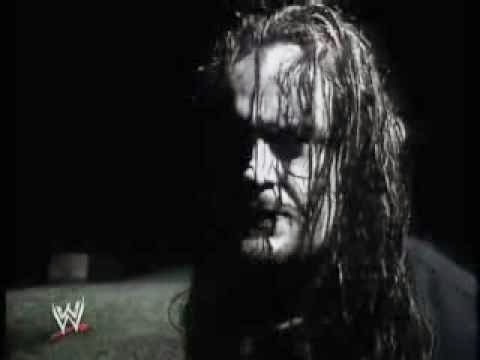 The persona never broke on me either, I have to admit when I first started watching the WWE a few of Taker's early promos gave me nightmares. 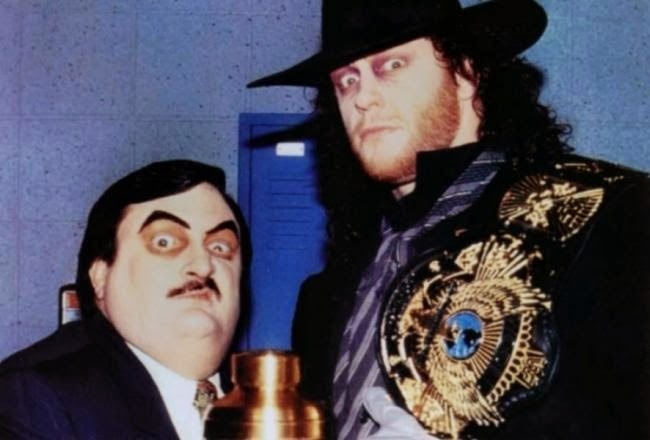 Whether it was the story of him burying people alive or him and the late Paul Bearer talking about Undertaker's young days at the funeral home.. there was simply no way that Taker couldnt impress you. 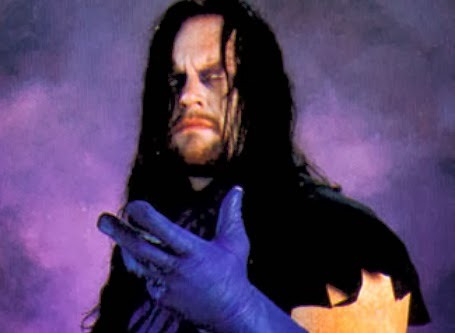 He went on to form the Brothers of Destruction with his other spooky and terrifying "brother" (kayfabe) Kane who had a similar persona to his. 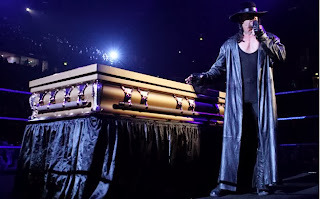 Undertaker was the creator of the casket match as well as the buried alive matches which is one of the most unforgiving matches in WWE history. Some people say his gimick was stupid...I say no. The way he played the role of an "undead human" was just marvelous. The way he talked, the way he cut promos, the way he rarely interviewed behind the scenes all made me feel like he really was an undead human even though we all know it is just screen play. 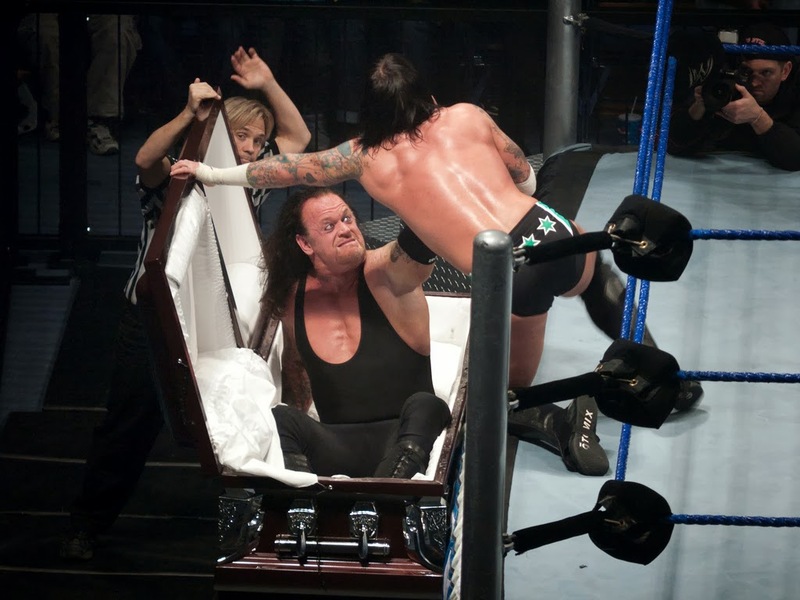 Who can forget when Taker was buried alive and his hand stuck up from under the grave? Who could forget when he was "burned alive" in a casket by Kane? All of these incredible segments could really make a young fan believe that this guy really was a spirit that could never be terminated and not a human at all. 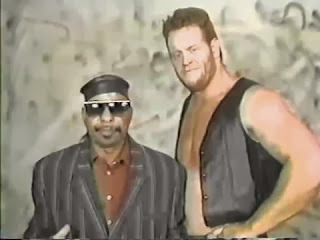 The only time Taker changed his person/gimmick in his career is when he became the "American Badass" from 2000-2003. Now this is not uncommon, many superstars change their apperacne or gimmick at least once in their career. During this time Taker was on the mic more, he had more behind the scenes segments, and most of all this time in his career he wasnt portraying the deadman gimick. It was a change for many fans seeing him play a classic badass, riding motorcycles, having a hot girlfriend, and acting like he ran the place (which he did! ), but the changed persona was still a hit on many fans including myself as I enjoyed his short few years away from lurking graveyards and ending peoples careers. Undertaker returned to the undead character when the bells hit for the first time in 3 years as the trench coated grave digger made his way trough the fog to the ring for the first time since his badass gimmick, and let me tell you the fans were right into it again! He went on to defeat Kane alongside Paul Bearer and stay undefeated at Wrestle mania. Taker went on to dominate the industry once again for the next 7 years before sporadically only returning for Wrestle Mania matches and keeping his undefeated streak alive. He had several reigns as the World Heavyweight champion in the later years of his career. In 2011 Taker started as I said before to only appear at Wrestle Manias and feud with opponents only the month before wrestlings biggest stage. Some believe him not appearing regularly anymore is due to his slowing abilities to perform in the ring as he nears the age of 50. Calaway is currently 48 years old and will be 49 come Wrestle Mania time where he once again will have another match defending the unimaginable 21-0 streak on the grandest stage of them all at Wrestle mania 30! Bring on Brock Lesnar? Here comes the pain? Maybe Taker's 22nd opponent will be the former UFC Heavyweight champion of the world. Despite being 49 at the time of the match next year, don't expect Taker to be slow...he will be ready to put on a 5 star match just like he always does. So what shoud you laarn from this article? You should now know a little bit more about Taker than you did before and you know what...shouldnt you know feel a little pumped that he will be returning in just months time? I know I cant wait! Today you learned about his persona, his changes in persona, and the beginning of his career in wrestling This was not an article to recap his career rather to discuss various topics about his never ending tenure with the wrestling industry and to discuss specific topics throughout his time with the WWE. I hope you guys enjoyed because this article took me a lot of thinking to do. The lord of darkness's legacy will live on even past the days were he truly is a deadman, now is that harsh? No. It is simply a showing of praise for the man with possibly one of the best in ring performers to ever do it and most well done persona's in wrestling history. Lets not forget that his legacy will live on forever and what he did for the wrestling industry will never soon be forgotten in the minds of fans all around the world . He really made the audience feel like he was in fact a dead man, and that is something I will never forget seeing him do as a young fan. 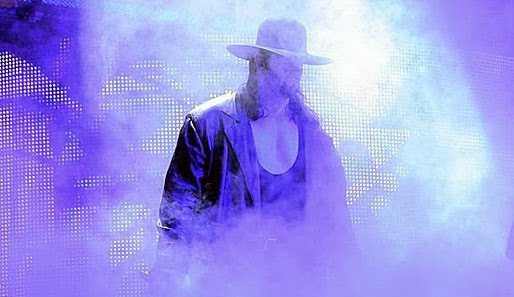 The slow walk in the fog, the trips to the graveyard, the choke slams into caskets, the buried alive matches, the promos from abandoned deserts, the myth of the man who never dies will always live in my mind as though it wasn't scripted...it was real because the way he portrayed a scripted character was done to such an exceptional level. Dan J carney is a sports writer for 3 online sports websites. He writes for Tru School Sports, RantSports.com (covers the Charlotte Bobcats), and he also writes for the league news.com. Dan is also a YouTube sports talk show host where he talks on his channel (DanJcarney) about trending topics, questions, and breaking news about everything and anything regarding the NBA, NFL, MLB, and NHL. You can follow him on Twitter @dan_jcarney, Subscribe to him on YouTube, or add him on Google+.